Hello first really cold day of winter! All thoughts of a brisk walk in the woods or a climb up a big hill went away after I stepped outside to get the newspaper. Last I checked, the temperature was trying to climb into the double digits. When it gets this cold, I want to curl up with the cat and read a book. I want to eat something warm, saucy, filling, and savory. And, a trip to the grocery store or anywhere in a cold car is not for a wimp like me. So this is one of those pantry and freezer cooking challenges days. 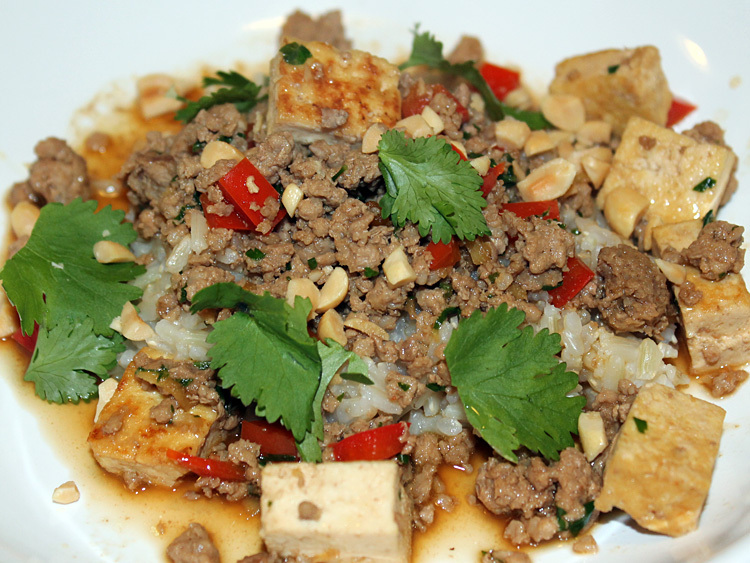 Fortunately, I had enough of the ingredients to make a version of Mark Bittman’s ma po tofu. I changed some of the proportions, left out green onions, and added red bell pepper and crushed peanuts. Because of the saucy nature of this dish, it’s best served over rice. It comes together quickly enough that you can start cooking the rice, then chop and prep all the vegetables, and the ma po tofu and rice will be ready at about the same time. I like firm tofu, pan fried at high heat with very little oil, but if you like softer, silken tofu, use that instead and skip the sauteeing step at the beginning. Also, I steamed broccolini and roasted strips of sweet potatoes to add some color and vegetables to the dish. Hope you like it. It warmed us up and gave us a good reason to stay inside today. 1. Start by cooking the brown rice, and if you are making the sweet potato strips, heat the oven to 375 degrees. 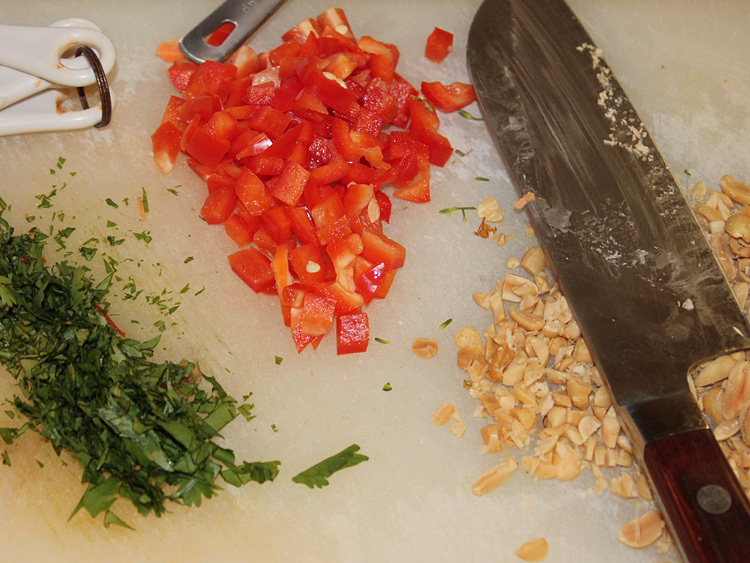 Chop and prep all ingredients. 2. If you are making the firm crispy tofu version, heat a large skillet on high heat, add 1 tsp of oil and the tofu and toss to distribute the oil. Let it cook undisturbed for 4-5 minutes and then stir, to brown all the cubes. When cubes are nicely browned, transfer them to a bowl and set aside. 3. If you are making the sweet potato strips, put 1 tsp of oil on a baking sheet, use a brush to spread it evenly on the pan, add the potatoes, brush them, sprinkle them with salt and put them in the oven. Check after 8 minutes, and turn them with the first side is done. Bake until they are soft when poked with a fork. 4. If you are adding broccoli or broccolini, steam it with method of your choice. I put it in a vegetable steamer and put that in a medium size pot with an inch of water, covered it, brought it to a boil, turned the temperature to low and steamed it for about 8 minutes. 5. While the sweet potatoes and broccoli are cooking, heat 2 TBS oil on medium high heat in a large nonstick stir fry pan. 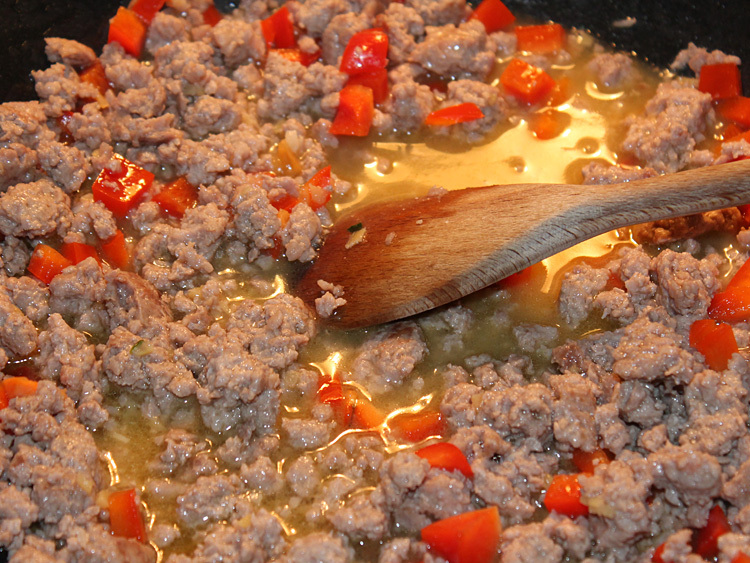 Add the garlic, ginger, and hot red pepper flakes, stir, and add in the pork. Break up the pork into small pieces with your spatula or wooden spoon and stir every few minutes. Cook until the pork is mostly cooked through and not pink. 6. Add the red bell pepper and the broth and cook for 2 minutes. Add in tofu and cook for 2 more minutes. 7. Stir in the soy sauce and minced cilantro and taste, adding more soy sauce and hot pepper flakes if needed. 8. 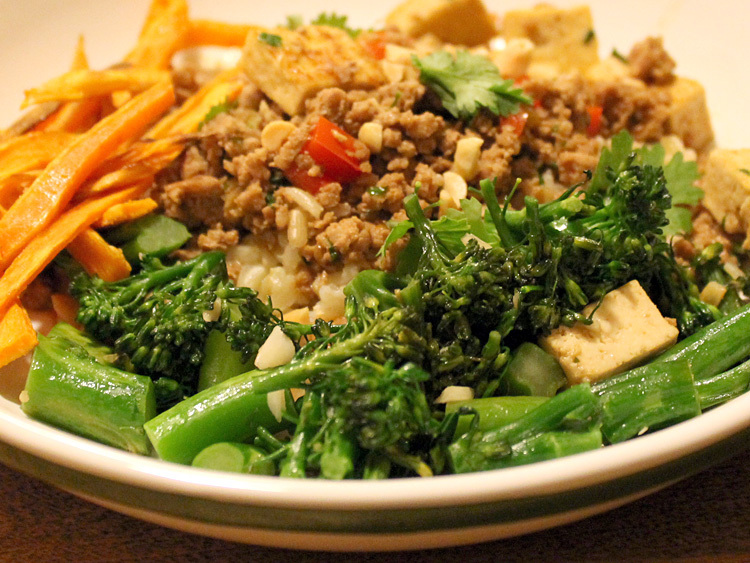 Serve the ma po tofu and vegetables over rice, and garnish with chopped peanuts and cilantro. This entry was posted in Comfort food, Healthy, Pork, vegetables by Amy. Bookmark the permalink.